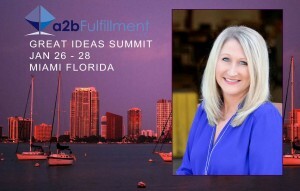 a2b Fulfillment will be exhibiting at the next Great Ideas Summit on January 26 – 28, 2015. The Great Ideas Summit brings together the direct response industry’s most influential leaders to hold high-powered meetings, close global deals, and develop new digital marketing strategies. Featured speakers include Becky Bui of Global Marketing Solutions. Her team helps marketers in the retail and e-commerce industry drive measurable business results by connecting to customers and prospects on Facebook. Mark Hughes of C3 Metrics and author of Buzzmarketing: Get People to Talk About Your Stuff will be there. As well as Jane Crisan, who has over 20 years experience in digital marketing and traditional advertising. Jane blends the craft & math of marketing to help connect brands and customers in the ever-evolving media landscape and digital ecosystem. The Great Ideas Summit is held by the Electronic Retailing Association (ERA) who’s membership is comprised of companies that use the power of direct response marketing to sell goods and services on television, online and on radio. ERA strives to promote thought leadership and the sharing of knowledge to advance the direct marketing industry as well as facilitate relationships that help members to drive their businesses’ growth and profitability. Make an appointment now with Debbie Skerly, Director of Business Development, Direct-to-Consumer at 866-843-3827 ext 211 or email her at dskerly@a2bf.com.